Golden Rice, genetically engineered to contain beta carotene, has long been the poster child for the benefits of GMOs—as witnessed by this Time Magazine cover of July 31, 2000. Beta-carotene is a precursor of vitamin A and the idea behind this rice was that it could—a conditional word expressing uncertainty—help prevent blindness due to vitamin A deficiency in areas of the world where this deficiency is rampant. But vitamin A deficiency is a social problem. Fruits and vegetables containing beta-carotene are widely available in such areas, but are not grown or consumed as a result of cultural or economic issues. If they are consumed, people cannot absorb the beta-carotene cannot be absorbed because of poor diets, diarrheal diseases, or worms. 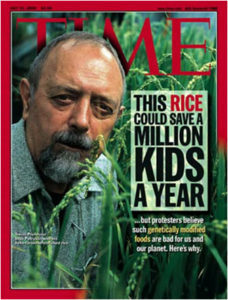 Here we are, 16 years after the Time cover, and Golden Rice is still not on the market. I predicted its current problems in my book, Safe Food: The Politics of Food Safety, first published in 2003. 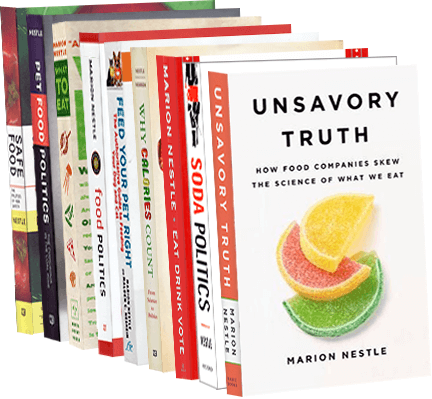 In Table 12 (page 158) I outlined the many basic research studies and research on production, consumer acceptance and use, and clinical effectiveness that would have to be done before Golden Rice could be shown to achieve its intended purpose. Much of this research has now been done but plenty more still needs doing on getting it produced and into the mouths of people who most need its beta-carotene. Proponents of the benefits of Golden Rice, however, complain that anti-GMO activists are responsible for keeping the rice off the market. As I learned long ago, even the slightest skepticism about Golden Rice is perceived by uncritical proponents of GMOs as an attack on science and the entire food biotechnology enterprise. If you publicly express doubt that Golden Rice can solve the vitamin A problem, you will be accused, as I have been, of responsibility for the illnesses and deaths of millions of children. As the table in Safe Food makes clear, Golden Rice is a highly technical approach to solving a nutritional problem resulting from cultural and socioeconomic factors. Such solutions do occasionally succeed. The best examples I can think of are iodized salt to prevent goiter and water fluoridation to prevent tooth decay. But both of these interventions address geographical mineral deficiencies, not deficiencies resulting from cultural prohibitions or poverty. Is Golden Rice worth a try? Sure it is. But not when it is used to demonstrate that GMO foods are good for the public as well as the owners of seed and pesticide companies. Arsenic in rice: another food issue to worry about? Is arsenic in rice something you should be worried about? I never know what to say about food contaminants consumed in tiny amounts, in this case, micrograms (millionths of grams) per serving. The FDA devotes a web page to arsenic in rice. Here, the agency releases the results of its testing, which found amounts of arsenic mostly below 6 micrograms per serving. Higher levels—11 micrograms per serving—were found in three samples from Texas, Louisiana and California. The highest was 30 micrograms per serving of hot ready-to-eat rice bran cereal. Is this good, bad, or indifferent? And how would we know? The FDA says such levels are too low to cause concern about short-term health problems. But Consumers Union thinks the real issue is the long-term effects. Today’s widely-reported message on arsenic levels in rice misses the point. The issue is not the short-term risks of rice consumption. The concern is the long-term effects from exposure to arsenic in rice. As Consumer Reports has said in the past, consumers should not ignore the potential risks from consuming rice and rice products over a long period of time…Consumers are not well-served if they do not have the full story. The concerns about long-term effects are significant and warrant the FDA’s decision to investigate further. At the moment, this is the best information available. FDA: get to work!